WASHINGTON, DC, April 9, 2019 (ENS) – David Longly Bernhardt is an attorney, government administrator, and former lobbyist for the oil and water industries who serves as Acting United States Secretary of the Interior. He is fighting for the department’s top position in the Senate, where he is going through the confirmation process to permanently replace former Interior Secretary Ryan Zinke, who resigned early this year under a cloud of ethics issues. Bernhardt served as Deputy Secretary of the Interior under Zinke from August 2017 until Zinke’s resignation on January 2 this year. 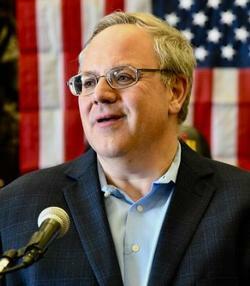 President Trump nominated Bernhardt for the top slot on February 4. The questions of balancing environmental protection with economic development and balancing his loyalty to the United States with his loyalty to former corporate clients were key themes on March 28 at Bernhardt’s confirmation hearing before the Senate Energy and Natural Resources Committee. These questions have persisted and are still troubling lawmakers today. U.S. Senator Ron Wyden, an Oregon Democrat, Monday requested that Jessie Lu, the U.S. Attorney for the District of Columbia, investigate potential civil and criminal violations of the Lobbying Disclosure Act of 1995 by Bernhardt, as well as by his former lobbying firm Brownstein Hyatt Farber Schreck. Wyden’s request follows public reports that indicate Bernhardt may have engaged in multiple direct lobbying contacts even after deregistering as a lobbyist for Brownstein in November 2016. Following concerns that Bernhardt may have made misleading or false statements during the committee hearing about his role in blocking a U.S. Fish and Wildlife Service assessment of the effect of toxic pesticides on several endangered species, Senator Wyden requested that the Interior Department Inspector General investigate these allegations. In March, U.S. Senate Minority Leader Chuck Schumer and U.S. Senator Kirsten Gillibrand, a member of the Environment and Public Works Committee, both Democrats, joined 15 other senators in demanding answers from Bernhardt on his plans for offshore drilling. The senators posed questions, ranging from whether he supports the expansion of offshore oil and gas drilling, to steps he would take to prevent a spill. They asked if Bernhardt would commit to holding meaningful, two-way public hearings with indigenous peoples in any region where offshore drilling is proposed, and they asked if he would meet with the governor of any coastal state that could be impacted by an oil spill. 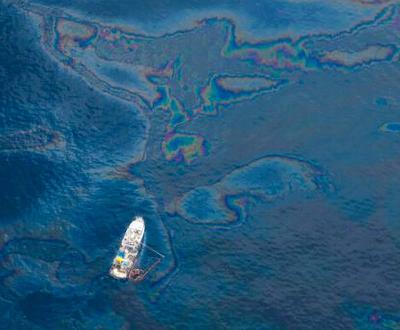 Doubt about Bernhardt’s will to protect the environment comes as the Interior’s Bureau of Ocean Management is expected to announce the next draft of its proposed five-year National Outer Continental Shelf Oil and Gas Leasing Program. Bernhardt signed an ethics agreement when he joined the Interior Department as deputy secretary in 2017 and told the committee during his confirmation hearing that he has complied with all of his ethics requirements. On April 4 the Senate Energy and Natural Resources Committee voted 14-6 to recommend Bernhardt’s confirmation to the full Senate. The Senate floor vote could come as early as this week. Meanwhile, the Interior Department’s Office of Inspector General is reviewing allegations that Bernhardt may have violated his ethics pledge by weighing in on issues affecting a former client, the office confirmed to “The Washington Post” on April 2. In an interview with Juliet Eilperin of the Post, Office of Inspector General spokeswoman Nancy DiPaolo said the office has not launched a formal probe into Bernhardt’s actions. “We’re reviewing the facts and requests to determine appropriate next steps,” she said. 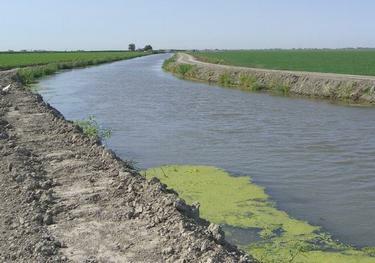 The client at issue is the Westlands Water District, the largest agricultural water district in the United States, made up of more than 1,000 square miles of prime farmland in California’s Fresno and Kings counties. Bernhardt represented the Westlands Water District at Brownstein before joining the Trump Administration in August 2017. He has consistently said that he has complied with all federal ethics rules and has not weighed in on particular matters affecting former clients. But Bernhardt lobbied to reduce protections for the Delta Smelt, an endangered fish that would be harmed by Westlands Water District’s move to drain water from the San Francisco Bay Delta and send it to farmers further south. In 2014, Bernhardt represented Westlands in a lawsuit seeking to weaken or lift Endangered Species Act protections for the smelt. In total, Westlands paid Bernhardt’s law firm more than $1.3 million in lobbying fees. Yet just four months into his time as deputy Interior secretary, Bernhardt directed agency officials to begin weakening protections for the delta smelt and the winter-run Chinook salmon to allow larger water flows for agricultural users, an evident conflict of interest. Bernhardt acknowledged directing his staff to weaken protections for the smelt, but said he first conferred with Interior Department ethics officials. Yet, despite his pledge to obtain a written waiver, Bernhardt received only verbal approval from ethics officials. To remind members of Congress that Bernhardt, “…likely is President Donald Trump’s most ethically-conflicted nominee and deserving of the moniker, ‘Swamp Monster,’ the nonprofit advocacy group Public Citizen is placing a team of bike activists on Capitol Hill this week to circle between Union Station, the U.S. Senate and the U.S. House of Representatives. 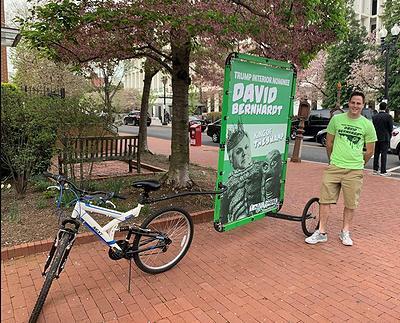 Starting Tuesday, activists will bike Capitol Hill towing green images of Bernhardt with the phrase “King of the Swamp.” Public Citizen has raised awareness around Bernhardt’s numerous conflicts of interest and failure to accurately release his public schedule. Public Citizen also filed an ethics complaint regarding whether Bernhardt violated Trump’s executive order on ethics. “Bernhardt has so many conflicts – more than departed Secretaries Tom Price, Scott Pruitt, David Shulkin and Ryan Zinke combined – that he carries with him a notecard listing them all,” Public Citizen alleged. Jennifer Rokala, executive director of the Center for Western Priorities, is not reassured by the Senate’s readiness to put Bernhardt’s nomination to a floor vote this week. Many Republicans in the Senate support Bernhardt’s nominations and appear untroubled by the ethics allegations of their colleagues across the aisle. Lisa Murkowski, an Alaska Republican who chairs the Senate Committee on Energy and Natural Resources, is a Bernhardt supporter.